BEIRUT, May 18 (Reuters) – The United States chided Russia for sending missiles to the Syrian government as plans for a peace conference promoted by Washington and Moscow were hit by diplomatic rifts over its scope and purpose. Sectarian bloodshed in neighbouring Iraq during Friday prayers, a hacking attack on a Western newspaper by sympathisers of Syrian President Bashar al-Assad and defiant comments by a rebel commander filmed eating a slain soldier’s flesh were all reminders of how the two-year-old civil war is metastising. But the divisions among world powers that have prevented a coordinated resolution were also again on display, just 10 days after Russia and the United States agreed to bury differences and push for an urgent international conference to end the war. 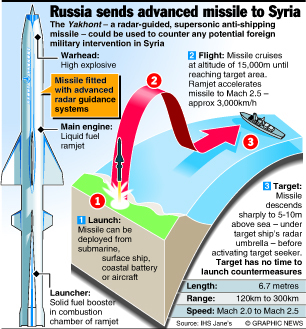 The most senior U.S. military officer, General Martin Dempsey, described Russia’s recent delivery of anti-ship missiles to Assad as “ill-timed and very unfortunate” and risked prolonging a war which has already killed more than 80,000 Syrians and which the U.N. said had driven 1.5 million abroad. While not responding directly to U.S. assertions that it had sent Yakhont missiles, a spokesman for President Vladimir Putin said Russia would honour contracts to supply Syria, which has been a customer for Moscow’s weaponry since the Cold War. “It’s at the very least an unfortunate decision that will embolden the regime and prolong the suffering,” Dempsey, the chairman of the Joint Chiefs of Staff, told reporters. With a range of 300 km (200 miles), the Yakhont could prove a threat to warships in the Mediterranean, should, for example, Western powers abandon their deep reserve and intervene to offer air support to the rebels, as they did in Libya two years ago. No date has yet been agreed for the international meeting, which appears to face growing obstacles. U.N. Secretary-General Ban Ki-moon met Putin in Russia on Friday and said the conference should take place as soon as possible. But highlighting the diplomatic conundrum it poses, France spelled out explicitly on Friday that it would oppose any meeting if Assad’s regional ally Iran were invited – contrary to the Russian position that Tehran should be part of a solution. The rebels and key Arab and Western backers will meet in Amman on Wednesday to discuss how to approach a conference. But it is also far from clear that Assad’s opponents can forge a united front or agree to meet the president’s representatives. After months of diplomatic stalemate, Washington and Moscow have been pushed to convene the conference by the rising death toll and atrocities, signs of escalation across Syria’s frontiers and suspicions that chemical arms may have been used. Three weeks ago, Israeli air strikes near Damascus that were said to target Iranian weapons heading for Lebanon drove home the risk of the Syrian conflict spreading further afield. As much was true of bombings last week across the border in Turkey. On Friday, dozens of Iraqis were killed in bombings which fuelled fears that the increasingly sectarian war in Syria, where Sunni Islamists are a part of the rebellion and Assad’s Alawite minority is backed by Shi’ite Iran, could plunge Iraq back into its own bloody civil conflict between Sunni and Shi’ite Muslims. Will the next iPhone handset be available in gold? What should Americans die for?